Green homes cover a wide variety of options. Green homes can simply refer to the fact that an individual or a family has chosen to have a green lifestyle in their home and as such has implemented green options such as solar power, hydropower or tankless heating options. Green homes may also refer to off grid living, Cob homes, geothermal homes or to real estate developments that are geared to a co-op program or ecological living program. There are various types of green homes available for individuals who want an updated or higher level of green living. The following are a few green home options for individuals considering green homes and the level of green living that each home option has. Green remodeled homes are homes that were not energy efficient or did not have green living options when they were originally built. Any home can be transformed into a green remodeled, with just a few simple choices and implementations. The first option would be to replace windows with double pane window options for energy efficiency. 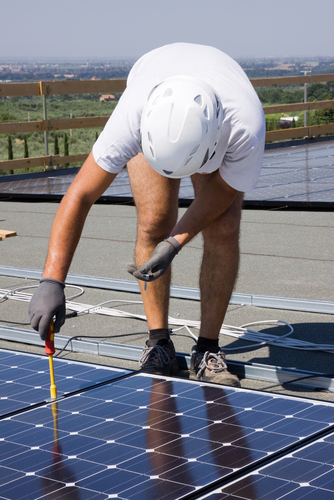 Another option would be to switch to a solar backup generator or to solar power for certain aspects of the home. Geothermal heating and cooling options are also available as are tankless water heating options. Removing old appliances and replacing these appliances with energy-efficient models are also part of green remodeled homes. Green remodeled homes generally are associated with energy efficiency labels or energy-efficient model home labels. Ecological co-op communities are communities that are developed specifically for green and ecologically friendly living. Many real estate developments are available that offer an individual the option to purchase a home in this ecological co-op community. In the co-op communities a home purchase is not a stopping point for green living. A co-op community requires that each individual participate in the community so that the co-op community runs as a small unit. Each home and ecological co-op community has green options such as geothermal heating and cooling, tankless water systems, composting toilets and community composting efforts. There also community recycling efforts and many of these co-op unities may outlaw certain types of chemicals from being used in the homes or certain types of transportation options. Cob homes and off grid homes are considered the most extreme form of green home option. A Cob home will still allow for electricity and for basic cable services and other modern features. A cob home can also be wired for the Internet or can use wireless Internet or satellite options. Cob homes can be built in any location and are generally built out of items indigenous to the area. For example, a cob home in Arizona may be built out of the various forms of sand and rock formations found in the area while a Cob homes built in a wooded area would be built out of the sand and optional woodland options of that area. Off grid homes are a higher commitment level for green living. Off grid homes generally do not offer any type of electrical option or modern convenience option. They generally use solar power or other off grid power options. In the most extreme cases they may not use a solar power option at all and live in a pioneer type atmosphere. These have become increasingly popular due to the fact that they have no bills, and there is very little investment in these homes.